The surrounding cards will tell you whether the communication is positive or negative. They can also provide insight into the kind of document – for example, the Tower can indicate a legal document while the Fish may indicate something connected to business or finances. Career: You should receive some form of appreciation at work, such as an award. Health: A prescription may be needed. Love: You should receive a love letter. 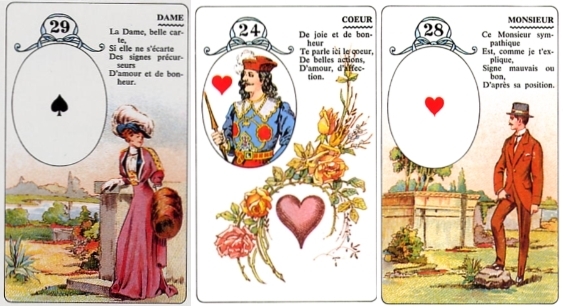 Timing: The Lenormand Letter is traditionally associated with the month of June. Cartomancy: The Lenormand Letter represents the 7 of Spades. It describes small arguments, melancholy, grief, and ailments. It could very well be that the child and letter numbers were switched at some point in history, but unless you’re using the house system to do your interpretations, I don’t think the numbers really matter. My advice would be to keep using the numbering system people are now using since most documentation and discussions will revolve around what decks people are currently using. The only time I’d switch things around, would be if the deck you’ve got in your hands has a different numbering system for some reason or another. If you do find this deck with the numbers reversed, I’d love to hear about more!